Could This 4.2-Equipped 2002 Audi S4 Pull $9,999? 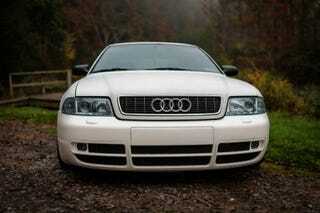 Audi never made a V8-equipped edition of its B5 S4. 'Tis sad but true. The builder of today's Nice Price or Crack Pipe '02 sought to remedy that oversight, and now you can decide if this custom's price is the remedy for ADWS (Audi Do-Want Syndrome). It's hard to decide which was the more egregious aspect of yesterday's 1993 Mercedes 500E, it's mileage, or its price. Of course this isn't nice miles or crack kilos, so we're going to have to go with the latter, and in that aspect, for 62% of you at least, the car proved to be too expensive. Let me just say to that 62% - you've probably never experienced one of these. In fact, being a little too expensive may very well be that muscle car Benz only sin. Its general concept - a big engine in a little car - is pretty much universally beloved, and these do come with a classically understated wrapper for all that awesome and obsessive German engineering. To the point, take a look at this very similar German car - a 2002 Audi S4 that has been imbued with 4.2 V8 goodness - and tell me if the mere thought of such a mythical beast doesn't give you the warm and fuzzies down where it counts. Okay, maybe its the Clap making you feel that way, but it could be the car. You should probably get that checked out. Audi's mid-sizer goes back to the heady days of the 1970s when the 80 (Fox in the U.S.) shared much of its engineering with the Volkswagen Passat. Actually you could go back even further in Audi's lineage and point to the Super 90 as an ancestor of today's car, or even the DKW F102 before that! Okay, that's probably going too far back, and after all you're not here for a history lesson, you want to know about this rockem-sockem S4. The ad for the car notes that it was purchased at 131,000 miles with the purposeful intent of wedging the 4.2-litre from a C5 A6 under its hood. That, I must say, is a laudable goal. Originally these cars came with a 2.7-litre, 261-bhp bi-turbo V6. That was a pretty impressive engine in its own light, but the eight is both more powerful - 295-335 bhp - and torquier - 295-310 ft-lbs, depending upon whether there was an A or an S preceding the 6 on its address. The seller says that the 4.2 in this implementation - along with the rest of the car - has been trouble free for 8K since the switch. He also provides a long list of features and new parts that I'm not about to duplicate here. Suffice to say there's a lot of new stuff on this S4. Gearbox duties are handled by a 6-speed stick fronted by a heavy duty 6-puck clutch and of course the car features Audi's patented Quattro AWD. It also looks pretty nice. The car is dropped so take that as you will. Aside from the lazyboy appearance, the white on black (ain't that always the case?) car seems clean as a bean, while inside there doesn't seem to be much to complain about unless you really don't like super shiny seats or iPads in your passenger footwells. Is it all Hooters wings and College Ball with this car? Well, no, there are some missing pixels in the MFA screen. I'd suggest looking under the seat for those. There's also the claim of three small dents in one quarter, and a pulley that's making noise. If that's an idler, no big deal. If it's connected to something that does something, that could be an expensive proposition. The car carries a clean title and comes with a video of it revving on the side of a suburban road, if you're into such things. That's all together a pretty cool Q-ship and its asking price is a ten-spot under ten grand. What you need to do now is vote on whether this custom V8 S4 is worth that sort of price. What's your take on this audacious Audi and its $9,999 price tag, does that seem like a good deal? Or, is this an S4 that es no asequible? Harrisburg Craigslist, or go here if the ad disappears.